Well you must be wondering why I labeled this at #TBT (Throw Back Thursday) well first, it's a children's book. Secondly this is also a part of my childhood and it's nostalgia. Any children's book I do review will be #TBT. Anyway on with the review! I've said before that Mary Poppins is one of favorite Disney films so when I saw the book at my local library I immediately picked it up despite being an adult and it being a children's book. 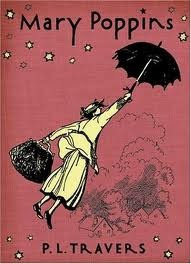 If you thought book Mary Poppins is anything like Movie Mary Poppins you would be mistaken. The first thing I thought when reading this 'Why the hell is she a nanny, she acts like she hates kids'. She is constantly pursing her lips in agitation, scorning them for asking questions, and then refusing to answer said questions. It may be all Julie Andrews fault, she has this way of looking at you with a twinkle in her eye that just makes you feel warm and cared for. One thing I will say about book Mary is that she does have the mysterious whimsy that was captured on screen and in the book Mary and the kids go on many more adventures and see so many fun things. It seems like as long as you are full of imagination you can do, see and go anywhere. Despite Mary's weird demeanor it was a pleasant read, one I can see a parent reading to their kids at night before bed.